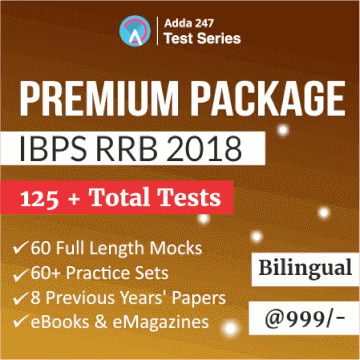 It's time to gear up and start preparing for IBPS RRB 2018 Recruitments. The exams are scheduled in the months of August and September and one needs to prepare well to beat the tough competition. It is a golden opportunity for aspirants aiming to become a banker in 2018 and to be able to get through the competition you must start practicing with the latest pattern based and the best practice material. RRB Office Assistant Prelims: 20 Full-Length Mocks. RRB Office Assistant Prelims Mains: 10 Full-Length Mocks. Get Classroom at Your Fingertips!! Check Out Video Courses by Adda247 for Bank Exams.